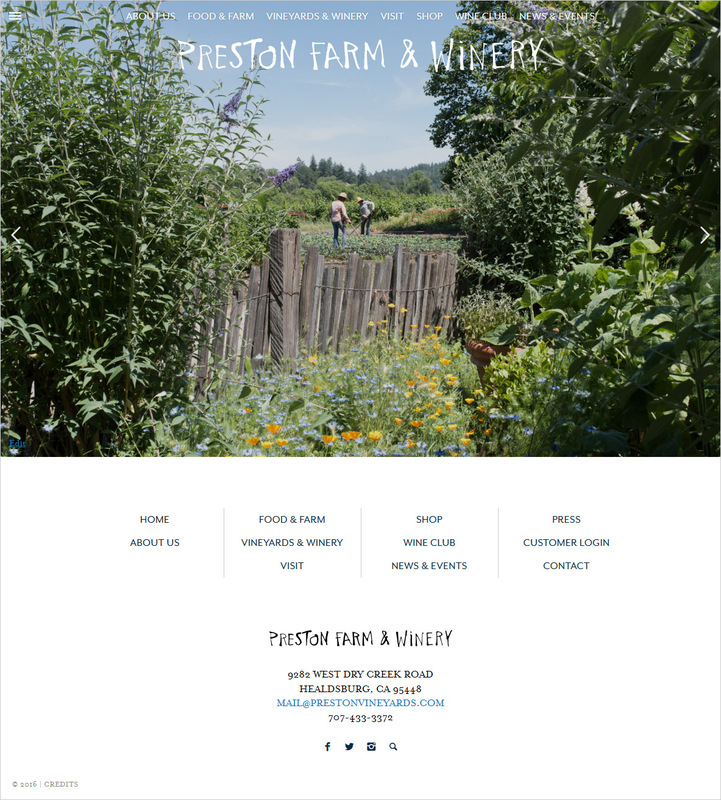 Preston Farm and Winery is a family-operated, organic and biodynamic property in Healdsburg’s Dry Creek Valley, guided by ethics of stewardship, sustainability, and community. Under 45 years of family stewardship, the land has evolved from an emphasis on wine alone to diversified crops including vineyards, vegetables, fruit and olive trees, grain, and pastured livestock. 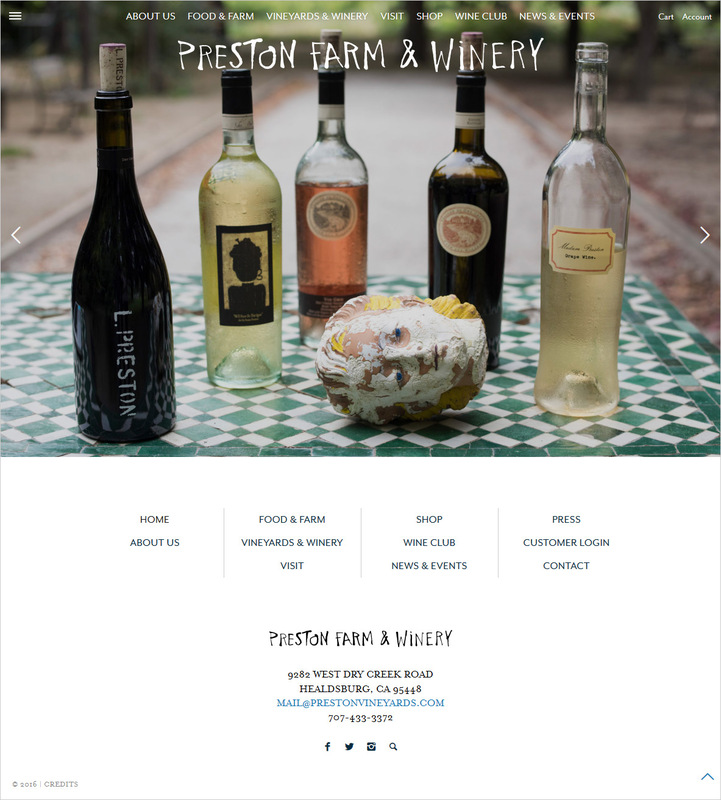 Their estate winery features a tasting room, farm store, and bakery with a wood-fired oven. Estate-pressed olive oil and cured olives, sourdough loaves, pickles, and produce from the farm are available for purchase along with the wines. Tell the story of the farm, agricultural philosophy, dedication to quality, and the people behind it all, to entice people to visit and purchase wine and farm products. 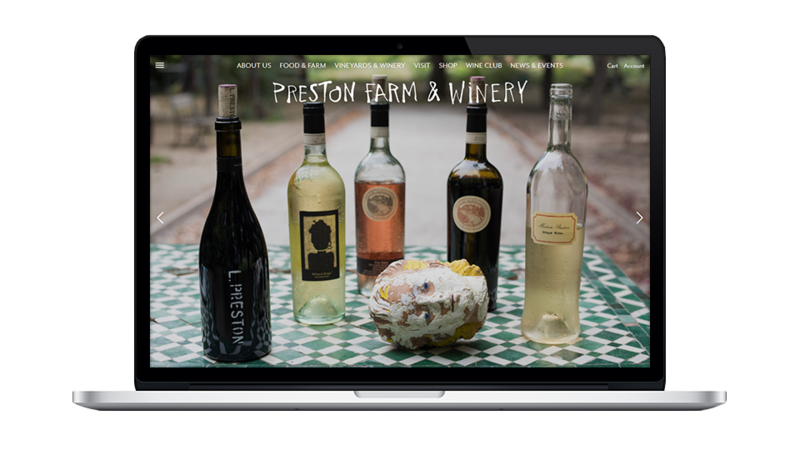 Express Preston Farm and Winery as artisanal, rustic, and cleanly simple, with a slightly eccentric whimsical character. Create a secure convenient purchasing experience for customers. Encourage participation in the wine club and mailing list, and facilitate sign ups. Appeal to a mixed audience including new and established wine drinkers, food enthusiasts, and people who value healthy organic products. Develop connection to community, including like-minded people and organizations with the same values. An important measure of a marketing design process is how quickly the creative professional “gets” the message. Our experience working with Jon Krauss of Vin Agency has been a mix of surprise and delight at his insight and talent weaving the elements of our story into the fabric that is now our website. There are many voices and visuals on our end; Vin quickly distilled them down to capture the essence and spirit of Preston: accurately, succinctly and practically. Working with Vin has been a pleasure.